Avid audience enjoys Ovid protest – BP or not BP? Tonight, three performers from activist theatre troupe BP or not BP? got on stage just before a talk by Greg Doran, Artistic Director of the BP-sponsored Royal Shakespeare Company. The talk was taking place at the (also BP-sponsored) British Museum, inside (of course) the BP Lecture Theatre. Doran’s talk was scheduled to cover the influence of the Roman poet Ovid on Shakespeare’s writing. Five minutes before the talk was due to start, the rebel performers walked onto the stage and presented their own readings from the same poet, choosing lines from Ovid’s Metamorphoses relating to the corruption of humanity by underground wealth, and the deadly power of floods and storms. At first, it was not obvious that the performance was a protest; the audience fell silent and listened attentively. When BP was first mentioned and the audience realised what was going on, the room filled with laughter and applause. Apart from a few predictable heckles*, the audience was overwhelmingly warm and supportive, applauding each of the performers and clapping more loudly in response to the odd bit of scattered booing. The actor-vists left the stage before the main talk began, handing out leaflets to the audience as they left. The full script is below, and a film of the performance will be posted here soon. 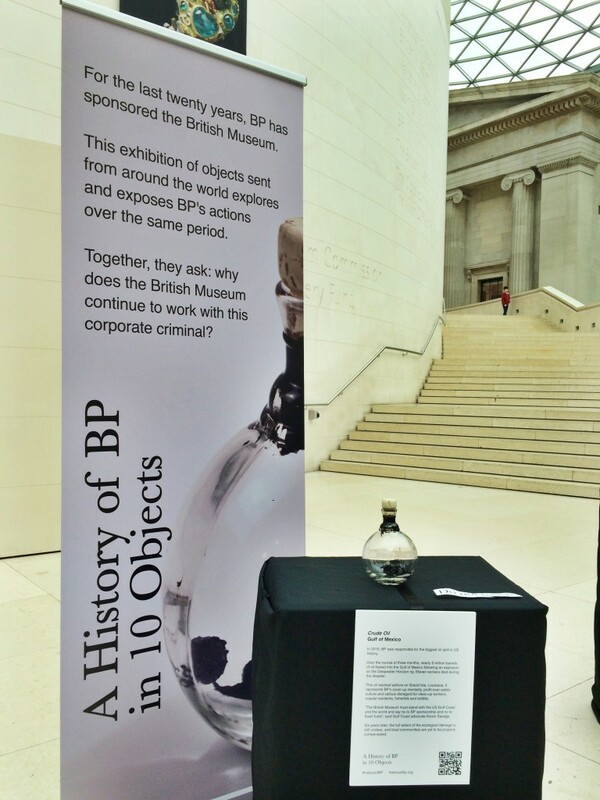 Tonight showed – once again – that the majority of audiences at RSC and British Museum events are supportive of our interventions against BP branding. We already know that two-thirds of British Museum staff agree with the aims of our protests, and growing numbers of theatre professionals are pushing for an RSC that does not taint their art with an oil logo. Meanwhile, the excuses given by these cultural institutions for their continued promotion of BP are sounding increasingly weak. Earlier this month, Greg Doran claimed that BP’s money ‘was needed’ and that it was ‘very difficult to unpick what is “good” money’. These claims fail to stand up to scrutiny; as campaigns and research group Culture Unstained explained this week, there are plenty of arts organisations with ethical fundraising policies, and the RSC made a £4 million surplus last year thanks to Matilda the Musical. At the same time, taxpayers are subsidising BP to the tune of hundreds of millions of pounds per year, dwarfing the amount the company spends on arts sponsorship; if we weren’t all paying to prop up the fossil fuel industry, we’d have plenty of money for the arts. It’s time for the RSC and the British Museum to listen to their staff, their artists and their audiences and stop promoting BP – before the climate completes its current deadly metamorphosis, transforming our world beyond repair. he drew the long confines, the boundaries. the treasures that spur men to sacrilege. to bearing off stout trees and giant rocks. the helpless horses’ speed did not avail. the bodies of young men in its wild whirlpools. * There sadly wasn’t time to respond to the hecklers’ questions, but in case they’re reading this: no, none of us had travelled there by car, and yes we do give money to the arts (as taxpayers, we all collectively give much more than BP). You can find more detailed answers to these questions in our FAQs.